Councilor Kim Janey had to fight back the tears as she praised Ayanna Pressley for being a role model for her, for the other four women on the Boston City Council, for people across Boston. Read more. With 20% of precincts reporting statewide, Question 3, which would uphold a state law guaranteeing the right of transgender people against discrimination in public places, is passing by a 2-1 margin. In Boston, it is passing by an even higher margin. Read more. NBC Boston reports officials shut a polling place at the Haynes House, 735 Shawmut Ave. this afternoon after white powder spilled out of an absentee ballot. Officials re-opened the polling place about 25 minutes later after determining the powder was baking soda. 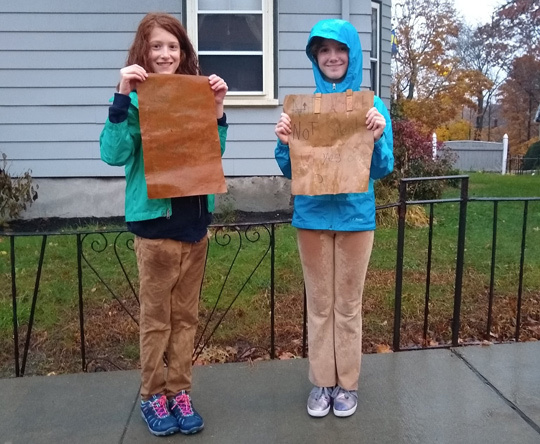 It's impossible to read their signs because the rain has wiped away much of the ink, but Mathteacherjedi reports these two kids, Ena and Thomas, were standing at Cummins Highway and Brown Avenue in the downpour this afternoon to show their support for a Yes vote on Question 3 for transgender rights. 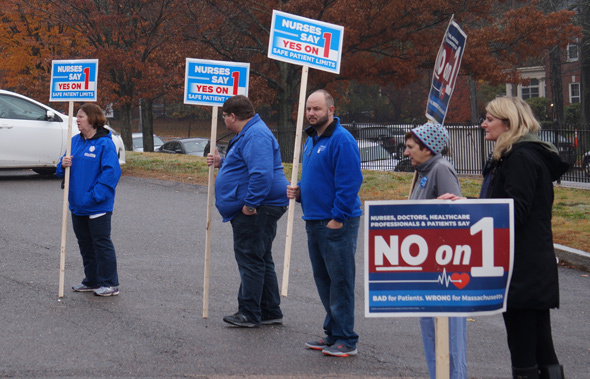 Competing human billboards at Holy Name School in West Roxbury this morning. Polls are open until 8 p.m. Some early reports suggest heavy turnout even here in Massachusetts. Jessica reports an hour-wait at her Somerville polling place. Slydon reports "more people voting in Egleston Square than I've ever seen at midterms." Long line in the North End: Read more. Great Massachusetts political ad in 2018 or greatest Massachusetts political ad in 2018? Bonus: Videoed at West Roxbury's Porter Cafe. Language is NSFW and NSFYankeesFans. If you agree that trans people deserve the same rights as everybody else, and want to show it in these increasingly dark days, you'll vote Yes on Question 3. And if you have time, you might even attend the Rally for Transgender Rights, 1 p.m. on Sunday at the 54th Massachusetts memorial at Boston Common, across from the State House. Liz Miranda, who likely will be the next state rep from the 5th Suffolk district (Dorchester and Roxbury) is opening her campaign office at 246 Bowdoin St. tonight as a place for people to grieve and figure out what to do following the five murders since Friday. Read more.